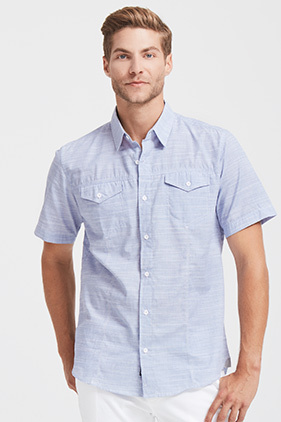 55% cotton/45% polyester 3.3 ounce short sleeve woven textured shirt. Two chest pockets with button flap closure. Front vertical stitching. Stitched yoke. Blue and red have black inner collar. Hemmed sleeves and bottom.